Nursing is a higher calling, and providing comfort and care to others is of tremendous importance to families, individuals and communities. 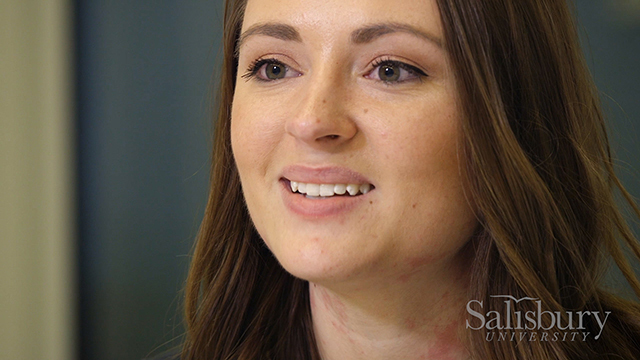 In the nursing program at Salisbury University, you'll have countless opportunities for personal and professional growth. From joining our Student Nurses' Association that's nationally recognized for community services to providing patient care in South Africa or Ecuador, your Salisbury training and experience will make you extraordinary. Why Choose Nursing at SU? Close interaction with faculty. For all direct care experiences, groups are typically no larger than eight students. This allows for personal attention and coaching while learning how to think like a nurse. Expert faculty practice what they teach. All classroom teachers also supervise clinical practice. What is taught in the classroom is applied and reinforced in a clinical setting. This bridges the gap between the textbook and the real world. Excellent clinical facilities. SU has clinical affiliations at a variety of hospitals, clinics, health departments and mental health care facilities. Among the hospitals is an award-winning regional trauma center. An advisor in your field. All nursing students are assigned a nursing faculty member for academic advisement. Our nursing graduates consistently have one of the highest five-year average NCLEX-RN pass rates in Maryland for baccalaureate programs at 92.28% (2009-present). Our accreditation by the Commission on Collegiate Nursing Education for the maximum period is further validation of the quality of our curriculum, faculty and resources. What’s more, career options for SU graduates are virtually endless. There are opportunities for employment in hospitals, long-term care and rehabilitation centers, health departments, hospice and home care and in occupational health. Some of our nursing graduates are practicing in other areas, such as law, research, international health, pharmaceutical sales and even on cruise ships. The School of Nursing offers three tracks to a Bachelor of Science in Nursing. This track is for nursing degree seekers who wish to become registered nurses (RNs). In this program, the first four semesters focus on General Education courses that provide a solid liberal arts foundation. The final four semesters are concentrated in the nursing component of the curriculum. Courses in the theoretical basis of nursing practice are combined with a wide variety of related clinical laboratory experiences. These are designed in collaboration with regional health care institutions and other health-related agencies. For students holding a bachelor’s degree in another field, this track is designed for those looking to make a career change. The curriculum acknowledges an individual’s education, career and life experiences and requires fewer prerequisites for the nursing courses than the above baccalaureate nursing program of study. Students may earn their bachelor’s degree in nursing after just three semesters of full-time study. This track is for students who already hold a resident state or compact state license as an RN. These students typically have a previous associate degree or diploma in nursing and may hold a bachelor’s degree in a non-nursing field. Depending on the individual’s academic coursework, this bachelor’s degree may be earned after two years of part-time study. Compare the nursing program’s admission process for first bachelor’s degree students and see how it differs from the admission process for second bachelor’s degree students and for registered nurses pursuing a bachelor’s degree in nursing. Understand and meet all health and enrollment requirements before starting your first clinical course. Learn how the nursing faculty prepared Logan for clinical settings and one-on-one work with patients. Our faculty engage in research and clinical practice, publishing their work in such prestigious journals as Journal of Nursing Education and Nurse Educator, and they practice at area hospitals and clinics. They also lend their expertise to national and regional health organizations and advisory boards. We are very proud of our students for their continued success on the licensure examination. Outcomes like this are a testament to the academic rigor of the University’s nursing programs and the high-quality faculty who instruct and mentor students. Learn about our robust course offerings and when they are scheduled. There is a four-year guide for the Traditional Bachelor of Science in Nursing to help you graduate on time. Learn more about the School of Nursing, including our faculty, in-depth program information and student resources. Take advantage of opportunities to study abroad and earn nursing credits in our special Ecuador or South Africa programs. Meet with your fellow nursing students to develop networking and leadership skills in the SU chapter of the Student Nurses’ Association. By demonstrating superior achievements, leadership qualities and creative work, you could also be eligible for membership in the SU chapter of Sigma Theta Tau, the international honor society of nursing. For a full list of outcomes, search for your program in SU's Academic Program Student Learning Outcomes database.